Welcome to Sykes International, a market leader in the global supply and distribution of cranes and construction equipment. Our clients include some of the world’s top companies and organisations. We have an unrivalled reputation for meeting the demands of clients throughout the world for cranes and construction equipment, carrying a large amount of equipment in stock that is ready to deliver, erect and to start working for you immediately. Time is money and we can help you meet your project deadlines through prompt and efficient delivery, erection and an excellent after–sales service. We own the cranes and construction equipment that we sell so you can rely on us for immediate delivery. Whatever the size of your project we are able to supply you with cranes and construction equipment to meet your requirements. We offer a comprehensive range of new Demag cranes, Liebherr cranes and Kobelco cranes, which include crawler cranes, mobile cranes, overhead cranes, overhead gantry cranes, tower cranes, truck cranes and construction cranes. Our cranes, which also include used cranes, range in size from 50 tonnes to 1,500 tonnes. 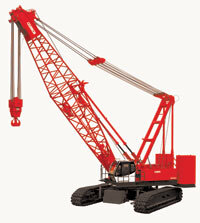 As well as selling cranes internationally we also buy cranes and equipment from around the globe. So whether you are interested in selling cranes or buying cranes, new cranes or used cranes, we are the company to contact. We buy and sell all types of construction equipment. This includes Caterpillar, Komatsu and Hitachi construction equipment. The majority of the equipment we deal in includes bulldozers, excavators, dump trucks and articulated dump trucks. With recently satisfied clients throughout the world, including in Australia, Libya, Dubai, Qatar, Saudi Arabia, America, Mexico and Europe, we are confident we are the company of choice when it comes to cranes and construction equipment. We are an established company with a solid name and have cranes and equipment available now, ready for immediate delivery. For cranes and construction equipment make sure you choose the right company: Sykes International.